Messengers from God... helpers... protectors... beings from the spirit realm... pure love... a race a little higher than human beings... spirit entities... heavenly guides. Guardian angels are the most well known. They stay with us from the womb to the time of our last breath and take us over to the Other Side. There are angels that stand around the throne of God. And there are angels whose job it is to sing Heavenly music. The archangels help us with protection, and healing and learning. A page of quotes about angels. 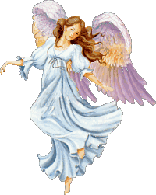 Check out Google's image page of free Angel wallpapers. Want to see inspiring angel art? Enjoy. See my page on books about angels and their descriptions. See the Angel video in the Sanctuary section with music by Frederick Delarus.